A new international study involving researchers from The University of Western Australia has found that carbon dioxide (CO2) has a positive effect on producing organic material at low temperatures in the Arctic Ocean, but that this effect disappears once temperatures increase. The research, published in Nature Climate Change, is expected to help improve predictions about the future impact of climate change. Phytoplankton are the first link in the food chain and are known as primary producers because they produce the first forms of food. Ms Lara Garcia-Corral, Research Associate at UWA's Oceans Institute and School of Plant Biology, said CO2 regulated the production of organic matter by marine phytoplankton, but the study discovered that the fertilising effect of CO2 was only noticeable while temperatures were low. "In spring, when temperatures are still low and enough nutrients are available in the water column, phytoplankton are more likely to mitigate the consequences of climate change, acting as if they were a big forest," Ms Garcia-Corral said. 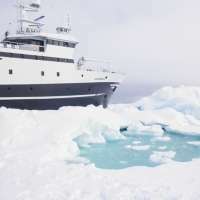 Led by researchers from the Spanish National Research Council (CSIC), the team compared laboratory experiments with in situ samples along a natural gradient of CO2 taken from several cruises in the Arctic Ocean. "The micro-organisms that form the phytoplankton community are the base of the food chain and account for 50 per cent of the annual primary production of the planet," Ms Garcia-Corral said. "Like plants and trees they capture carbon dioxide to grow and produce oxygen through photosynthesis." She said scientists had found that the ice cover of the Arctic had shrunk by almost half in the past two decades, which had generated an increased inflow of carbon dioxide of man-made origin into the ocean. "This influx of CO2 could benefit primary producers, but we cannot forget that the temperature of the Arctic Ocean is also increasing almost three times faster than global temperatures," Ms Garcia-Corral said. "With the advent of the summer, when the temperature increases, the fertilising effect of carbon dioxide diminishes to nothing and the ability of phytoplankton to capture CO2 decreases," she said. "These changes have a significant impact on ecosystems and the regulation of CO2. Therefore, they are fundamental to elaborate projections of future impacts of climate change." Are marine ecosystems headed toward a new productivity regime? Well, gosh, since it also makes it hotter, what's the benefit? The Deniers will have to re-calibrate their assertions. We already knew that fish migrate to colder waters in summer to where their plankton food has gone. This article just confirms the reason for plankton migration. Also this warming (and overfishing ) means that fish are getting much further from European sea birds nest sites and its getting worse. Another one in the eye for the deniers. This is what experiments on heat tolerances and plant toxicity have been telling us for about three years now. Nothing new. I'm still waiting for AGW Cult "science" to show how a warming ocean absorbs more CO2...oh wait.. it does NOT. The solubility of any gas in water (or seawater) depends on more variables than just temperature. What you seem to be missing is that it is proportional to the partial pressure of the gas in contact with it. If you increase the partial pressure you increase the solubility. If you increase the temperature you decrease the solubility. So, take the ratio of ABSOLUTE temperatures and the ratio of post-industrial partial pressure of CO2 to the pre-industrial CO2 partial pressure and tell me which ratio is larger. If not, take a chemistry course. You don't have to wait any more, but that does not mean you understand it. Instead, I expect you to come back and make this same ignorant statement time after time. If this is in response to my comment on partial pressures you have now demonstrated your inability to read. The writeup you posted is concerned about the lack of ice, and says nothing about temperature or pressure and their effect on solubility. Here is their overview of their concerns. But as the Arctic sea ice shrinks, the ocean absorbs more of the sun's heat in summer, postponing the freeze until all the warmth dissipates. It is clear you can't even read your own posted URLs. Hey thermomoron, if you could read you would realize that the link I provided shows what's actually happening in the arctic refutes this story. Now, could you find me a peer-reviewed study on your claim of CO2 absorption. Could anti or anyone else show me where his link shows that partial pressure does not control absorption of gases in water? Come on anti, show where your link refutes the influence of partial pressure? Would others please read anti's link and show me what he has in mind in case I missed it? fluid. Increasing temperature decreases the solubility of CO2 in the fluid unless the pressure and temperature is approximately above 30 MPa and 65 oC respectively, where solubility begins to increase. That is exactly what I said above. As the temperature goes up the solubility goes down and as the partial pressure goes up the solubility goes up. Partial pressure is going up faster than temperature. This is the second link you have provided that bolsters my reality instead of your delusion. You just don't seem to be able to understand what you link to. unless the pressure and temperature is approximately above 30 MPa and 65 oC respectively, where solubility begins to increase. You really are a thermoron. Is the partial pressure and temperature greater than that mentioned above? Everyone should read this thread just to see how little you understand science. I know it does not matter to you because you are a paid shill but it should matter to anyone who reads what you post. Do you know what 30 MPa partial pressure (or as they point out in your link - fugacity - which I have pointed out to you before) and 65C would mean to the oceans? This is one of Anti's funniest posts. Anyone care to explain to anti what those conditions are? Tell me thermoron, is there any outgassing of CO2 from the oceans? What does this have to do with the discussion of the effect of partial pressure? Are you just trying to change the subject since anyone reading this can see how poor your understanding of chemistry is? Wow, thermoron adds 2 and 2 comes up with stupid. Tell me, if your claim is true, could there be outgassing of CO2 from the ocean? The thread about partial pressure is still waiting for you. You either understand that increased pressure increases solubility at constant temperature and that increasing temperature at constant pressure results in lower solubility. Then the issue becomes the rate of change of the two variables (I hate to mention rate of change because it implies calculus and I know that is one of your many weaknesses). So, do you understand that or do you still have a different perspective? Come on, show us how little you know. This is *basic* chemistry, with the emphasis on basic. Partial pressure is going up faster than temperature. Alright thermo, let's do some calculus. Give me your data you used to make that claim. Thermo, "out" this phony, please. Ha...ha...ha..it's the Pathological LIAR. Got those solar panels yet? Oh boy, that's ironic. This thread is a worthless follow. Thermo, far from changing the subject. The above is a well established fact and refutes your claim that CO2 partial pressure is rising faster than temperature. I'm still waiting for the data that substantiates your claim though. Do I need to do the math for you? Do you understand how this works or do I, or thefurlong, or runrig, or TCS, or MM, or anyone else with technical background have to step you through it?